Last summer it got quite hot here in southern New Mexico, too hot for my husband Kelly Hart to work out in the garden. As for me, I don’t garden in the yard in the middle of the day. So he began doing wood sculpture, sometimes in his basement workshop, sometimes outside in the shade. He’s always been artistic in several ways, from animated films to water colors to photography so it didn’t surprise me. A new art form at 73? Sure! He’s kept on all year. 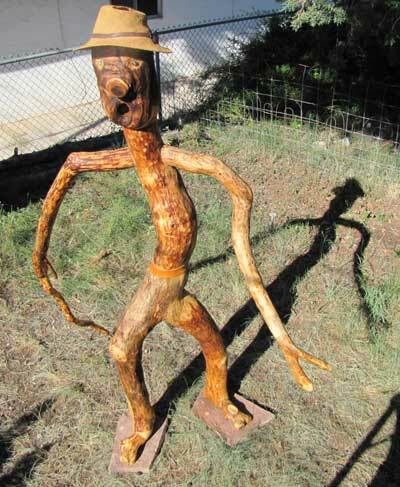 He put a webpage up that shows all the sculpture he has completed so far. It’s here, with seven sculptures on it so far. One of these was a commission, one is showing in a store downtown, one was a birthday gift to a friend, and the rest are here for now, both inside and out. Mitochondrial Eve is the most ambitious so far, and he’s been communicating with possible places for her to go. Here’s the first piece, called El Cantor. Do go take a look at the rest! Thanks, Isadora! I told him and he grinned. Next time you come this way (if you do), there may be even more to see! Kelly, I love the new direction your relationship with wood has taken you. Truly whimsical and marvelous.